Only one more month to go and then we will start the new year. 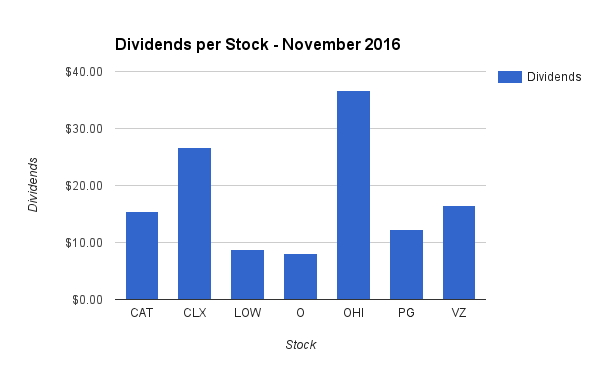 Before we get to 2017 though, we need to give our most recent dividend income result for November. 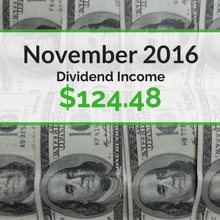 When it comes to dividend income, November is just one of those months that slowly helps to build our portfolio. Overall, we saw healthy growth compared to last month as well as last year. We continued to add new investments, collect and reinvest dividends, and even got a raise from a company or two. 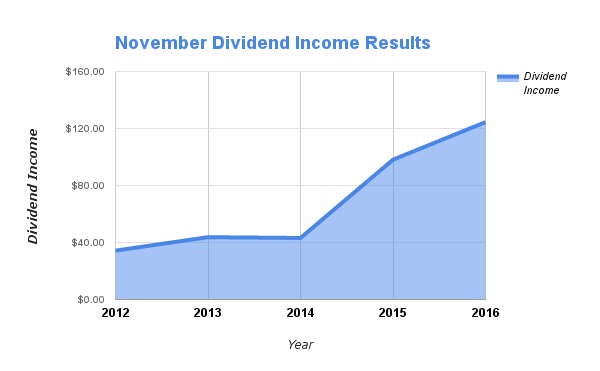 Each month I take the time to post our dividend income results. I find this to be helpful as it shows the small steps we are taking in building this income stream. Since we are not loaded with unlimited cash to invest, my wife and I simply invest what we can one month at a time. As you can see below, consistently investing and growing your portfolio will bear nice returns over the course of several years. The month of November will likely never be a record setting month for dividend income. We will save those milestones for next month (December) when we should hit a new all time high for dividends in one month. While no records were broke this past month, it was still the best November we have ever recorded for dividends. Our income grew by over 26% from the same month last year. I love to see that kind of growth each month and year and hope to continue that trend in the future. We had 7 stocks pay out a dividend in November, and they were from some awesome companies. Do names like like Caterpillar, Clorox, Lowe’s, Verizon, and Procter & Gamble sound familiar? We saw an increase of over 26.8% last month compared to November 2015! This is a direct results of many years of investing new money one month at a time. It was good to get back on track with new investments in November. We recently set a goal to grow our forward annual dividend income to $3,000 by the end of 2017. This would be an increase of $900 from our current 12 month forward dividend income. Most of this increase to reach our goal will come from new investments. A much smaller increase will come from dividend reinvestment’s and company dividend increases. Note – All of these investments were made through our Robinhood and LOYAL3 accounts … which means we did not pay any commissions or fees on these trades. 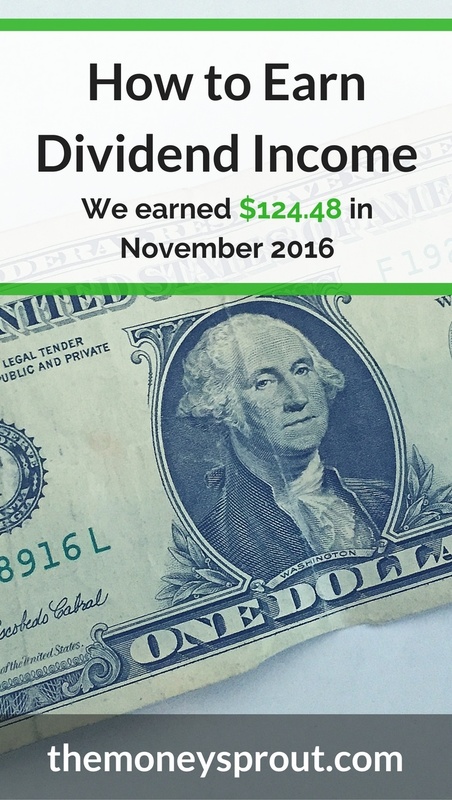 The dividend income earned in November ($124.48) was up over 26% from the same time last year. These increases were from a combination of new investments made, dividend reinvestment’s, and company dividend increases. Our goal for 2016 is to earn $2,250 in dividend income. To date, we have earned $1,649.28 in dividends for the year. At this point, we are on pace to earn a little over $1,925 in dividends for the year. With only one month to go in the year, it means we will not hit our goal of $2,250 We should be very close to reaching $2K for the first time … but will likely come up short. Full Disclosure – At the time of this writing, we owned shares in the following stocks noted in this post – AAPL, ADM, AFL, CAT, CLX, LOW, O, OHI, PG, TGT, VZ, and WMT. The material above is not a recommendation to buy. Please do your own research on a company before deciding to invest.